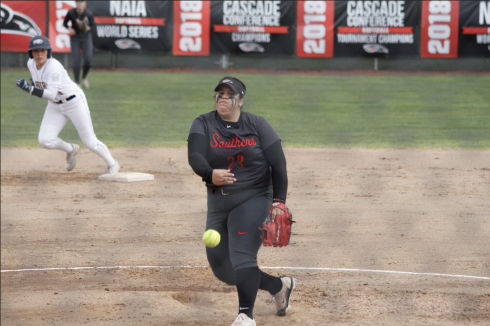 In action Tuesday April 12th The Southern Oregon Raiders softball team pulled the doubleheader sweep of the season against the 17th ranked Oregon Institute of Technology Owl’s at University Field in Ashland, Ore. The Raiders played near perfect defense, found timely hit’s and Jordyn Kurtz shamelessly baffled the OIT hitters all afternoon, while ending the Owl’s 11 game winning streak 3-2 in walk off fashion. Then kicked them while they were down in the nightcap 3-1. Multiple huge stories emerged during the doubleheader, but none was more impressive then Jordyn Kurtz’s yeoman like work in the circle, where she looked to be on a different level then the batter’s she dominated. In the circle all 14 innings, Kurtz only allowed 3 runs, 2 earned, on 10 hits while striking out 12 batters, OH YEAH she also hit a homerun and a double. The best indication the team is heading in the right direction went way beyond pitching, as the underclassmen heavy infield played awesome defense all day long. Melissa Corn at 1st nearly dove into the dugout on one play, and then on another hard grounder off her glove 2nd baseman Sierra Anderson pulled the ball out of the dirt as she dove head long at the 1st base bag to record an important out. Meanwhile, Irene Barrantes handle the hot corner and Rayna Okimoto range from the circle to foul territory, while playing shortstop without any miscues or errors. The stellar defense extended to the outfield as Brooke Springer, Katie Moy and Sarah Wharton ran down pop flies, line drives, and threw great when runners tested them. The Owl’s held a 2-0 lead going into the bottom of the 4th inning, when a couple of monster hitting plays energized the team and they outscored OIT 6-1 over the next 10 and a half innings for the sweep. The bottom of the 4th inning started with a hard deep fly to the right centerfield warning track for an out, before Kurtz ripped a monster double off the left centerfield fence, and her runner (Danielle Batson) stole 3rd. Then, as the team was chanting, “Freshman!!! Freshman!!! Do something crazy, Do something crazy!! !” Freshman Julia Willison smacked a grounder in the hole between the 1st and 2nd baseman and legged out a hit as Batson scored in the background. Outs came easy for the pitchers over the next 2 innings, until Kurtz’s stepped into the batter’s box in the bottom of the 6th and blasted a homerun to deep right centerfield to tie the game at 2 each. As if floating on a cloud, Kurtz bounced into the circle struck out the first batter and forced 2 weak grounder’s to Anderson at 2nd base for easy outs. As the 7th inning continued, Emily Matekel hit a hard line drive to leftfield to start the game-winning rally, before Sarah Wharton placed a bunt so perfect she was nearly safe sliding head first into 1st base. Coach Kim Fritts lifted Matekel for a pinch runner (Mischa Meyer), Moy followed the action with a walk, and a player struck out, which left runners on 1st and 2nd with 2 outs and Okimoto in the batters box. Okimoto smashed a hit thru the middle of the diamond, the runners broke immediately with 2 outs and a play at the plate was inevitable. The Owl’s centerfield came up with the ball clean, but it was obvious Meyer would score as she preformed a flawless hook slide, behind a LATE diving catcher, for the game winning run SOU 3-2. “The felt great! I just put the pressure aside and looked at that at bat like it was a regular at bat, a normal hit, you know,” Okimoto said, moments after driving in the game-winning run. Game 2 was a continuation of how the first game ended, with Kurtz working the ball around the strike zone, defensive players excelling and 6 batters on offense recording at least one hit. The Lady Raiders jumped to an early 3-0 lead with excellent offense from multiple batters, including a Moy triple and Corn’s near homerun double off the leftfield fence. As Kurtz dominated the circle for the second game and defense pulled out all the plays, save for the one run produced on an error. 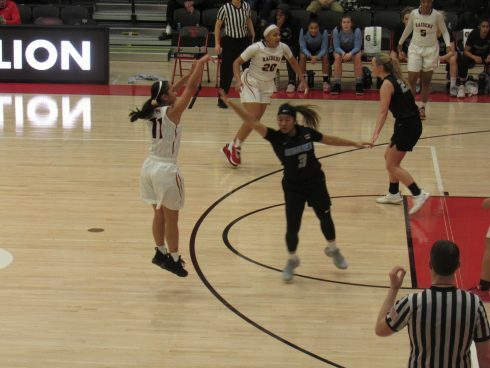 The wins help SOU move deep into contention for the playoffs at 9-7, and the Owl’s are looking fine at 13-3 in conference coming down the stretch.